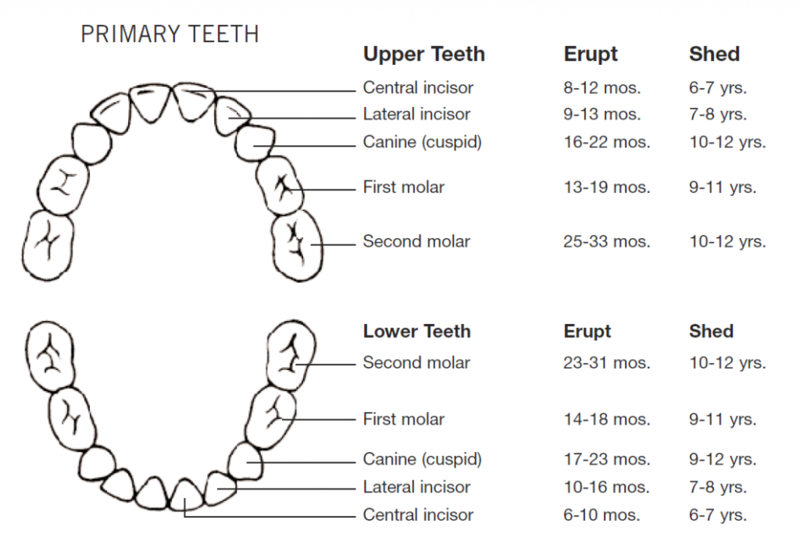 Most children have a full set of 20 baby teeth by the time they are 3 years old. As the child grows, their jaws also grow, making room for their permanent teeth. The baby teeth will then fall out (shed) at various times throughout childhood. Your child’s baby teeth are at risk for decay as soon as they first appear. Tooth decay in infants and toddlers is often referred to as Baby Bottle Tooth Decay. It most often occurs in the upper front teeth, but other teeth may also be affected. In some cases, infants and toddlers experience decay so severe that their teeth cannot be saved and need to be removed. The good news is that tooth decay is preventable! Begin cleaning your baby’s mouth during the first few days after birth by wiping the gums with a clean, moist gauze pad or washcloth. As soon as teeth appear, decay can occur. For children younger than 3 years, brush their teeth using fluoride toothpaste (the amount of a grain of rice) with a soft bristled, child-size tooth brush. Brush their teeth gently twice per day (morning and night) or as directed by a pediatric dentist or physician. For children 3 to 6 years of age, use a pea-sized amount of fluoride toothpaste. Brush their teeth gently twice per day (morning and night) or as directed by a pediatric dentist or physician. Supervise children’s brushing and remind them not to swallow the toothpaste. Until you’re comfortable that your child can brush on his or her own, continue to brush your child’s teeth twice a day with a child-size toothbrush and a pea-sized amount of fluoride toothpaste.